Not your average guy, not your average meal. A cook campaigns to fight hunger and change lives. Cheeseburger macaroni casserole was the entree and butter- and maple-glazed carrots were offered as a side. Guests dug into tossed salad with mixed greens and vegetables. Others nibbled on citrus slices and strawberries. Pastries, cookies and pies were served for dessert. The meal may sound like an nontraditional Thanksgiving feast. 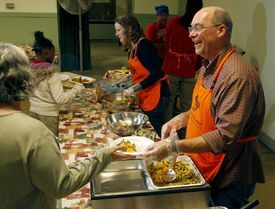 But really it was just another Tuesday evening at the Corpus Christi Church in northwest Dayton, where needy residents come for a free dinner. Chuck Wourms cooked the dinner. He also collected the food to make the meals. He also spent some of his own cash on fruit items. He also collected the activity books, flash cards and games that were given out to children or their caregivers. Wourms’ nonprofit, Food for the Journey Project, is not your average soup kitchen. And Wourms is not some run-of-the-mill do-gooder. Wourms has devoted his life to helping people in need and deserves recognition for putting others first for so long, said his long-time friend John Sullivan. Sullivan nominated Wourms as a Dayton Daily News Unsung Hero. 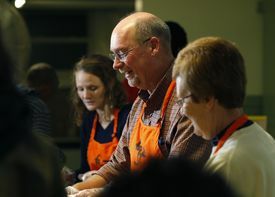 “I can’t say enough good things about the guy, he works really hard to make a positive difference in the community,” said Melodie Bennett, executive director of the House of Bread, where he’s volunteered and worked. Wourms, 59, of Beavercreek, worked for 11 years as the operations director for the Friends of Saint Francis, which runs thrift stores in the area. He then served as the operations director for the House of Bread, a nonprofit community kitchen. In 2014, Wourms began researching how he could create his own charitable organization. Late last year, he applied for and received 501(c)(3) status for the Food for the Journey Project. The project started off distributing sandwiches and prepared carry-out meals. 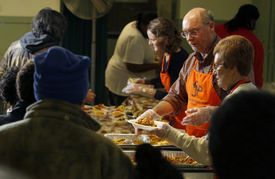 But in April, the project began hosting Wednesday-night dinners at Our Lady of Mercy Church Dayton, Ohio. Four months later, the project started hosting Tuesday-evening meals at Corpus Christi Church in the Five Oaks neighborhood. The project is entirely volunteer-based with no paid staff. It has served more than 4,000 meals and plans next year to start offering weekly meals at an East Dayton site. Bennett, with the House of Bread, said Wourms has had a big impact on fighting hunger in the community by looking at different ways to serve people, especially in light of the changing face of hunger, as people lack access to adequate supplies of nutritional food. Wourms collects donations, cooks the meals, handles food preparation and then oversees the serving activities. He spends at least 45 hours per week on the project. The project has a small group of donors, but is working to expand its list of contributors. Food for the Journey Project is unique in that it is a mobile feeding program that goes out into local neighborhoods to serve meals directly to Dayton residents and families, said Sullivan, who is the president of the project’s four-person board. Many individuals and families struggling with hunger do not have reliable transportation to travel to local food kitchens, and Food for the Journey brings the meals to where they are needed, he said. At a recent evening meal, the vast majority of guests arrived on foot. The feeding events tend to draw people primarily from within a one-and-a-half mile radius. The project partners with neighborhood groups and churches that have identified unmet needs, Sullivan said. Wourms has a talent for making tasty meals that cost less than $1 each, friends said. Still, Wourms regularly spends his own cash to buy items needed to provide the project’s trademark, multi-course meal, which includes a hearty mix of proteins, starches, fruits, salads and desserts. “We want it to be a banquet,” said Wourms, the married father of two children. Wourms designed the events to do more than just fill bellies. They are intended to replicate the family-meal experience, where conversation is encouraged and guests interact. Guests with young children can play games, read books or complete puzzles together. Children and their caregivers are encouraged to keep the books and games. Also, volunteers at the events pass out little baggies full of donated hygienic items, such as toothpaste and shampoo. During meal time, Wourms is in constant motion, checking in on guests and cracking jokes and shaking hands. Wourms gave a big hug to a guest that had not made it to the prior week’s meal. Wourms was relieved the man was OK.
Later, Wourms locked arms with a man who was having trouble walking. He guided the unsteady man to a seat, and volunteers brought him plates packed with food to spare him the trip. The dinners are source of stability for many people who have markedly chaotic lives, Wourms said. And it’s clear that no matter their circumstances, no matter their hard-luck, guests have a place to go on Tuesdays and Wednesdays for a hot meal and comradery. People who struggle to feed themselves often have emotional, psychological or physical problems. These hardships can make people feel isolated. 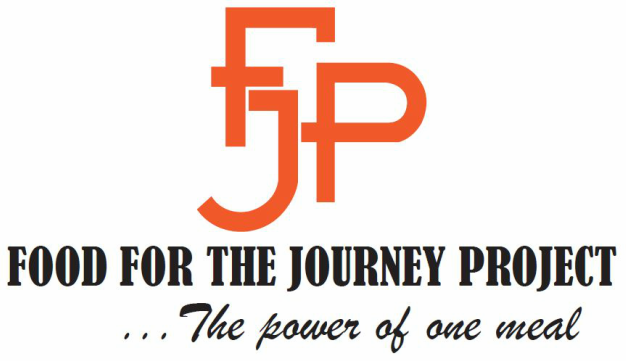 But everyone is welcome at the Food for the Journey events, regardless of their economic situations or hangups. Phillips and several of his neighbors try to attend the weekly meals, depending on their work schedules and personal obligations. Chris Goode, 48, said the free meals provide much-appreciated financial relief and prevent him from having only sleep for dinner on some nights. Mike D., who declined to provide his full last name, said he used to have a good-paying job in tool and product design, but it disappeared after the auto industry flirted with collapse. “Now I’m engineering subs on North Main Street,” he said. Mike said it’s hard to stock the fridge on his wages. He so many Dayton residents are in the same predicament, and the weekly dinners make a big difference in his life. Wourms said many residents live on the edge and are just one life event away from food insecurity. But, Wourms said, people in need can count on the Food for the Journey Project, because people should not have to worry about where their next meal will come from.